In last weekend's post, I promised something about Storybook scheduling and free passes, so here it is! I probably need to break this up into separate posts, but this will do for now. The Storybook is really the heart of my classes, so please forgive the long post. You can find related posts also with the Storybook label. Starting in Fall 2014, there is an alternative semester-long project, the Portfolio. BRIEF DESCRIPTION. A completed Storybook website has a coverpage, introduction, and four stories — but it is also entirely possible to have a nice little Storybook with three or even just two stories. The Storybook schedule is flexible enough to accommodate these possibilities, and it also includes two "free passes" for students to choose when they need them. There is an archive of Storybooks for both classes, and the schedule I will be discussing in detail below is here: Storybook Schedule. Week 1. Storybook Favorites. Students browse the archives of past projects and start to think about something they might want to do as their class project. Seeing what other students have done is so much more effective — and inspiring — than just reading instructions from me! It also gives them a sense of how important the Storybooks are not just now, but in the future. Next semester, after all, future students could be looking at the Storybooks they will now write and choosing them as favorites. Week 2. Brainstorm Topics: Myth-Folklore - Indian Epics. This is a really fun assignment for me to read and reply to because it gives me a sense of just what the students are really interested in! One of my favorite parts of the whole semester, in fact, is reading and replying to this assignment, giving students lots (and lots and lots) of suggestions about online resources to use for the topics they are considering. Week 3. Brainstorm Storytelling Styles. For this assignment, students choose their topic and start thinking about possible storytelling styles. While I written up some information about the wide range of possible styles, the most valuable resource here is the archive of past Storybooks, where students can see how different students have developed different storytelling styles in the past. Week 4. Storybook Introduction. This is also the first piece of writing that students do for the class which will be revised; they receive detailed comments back from me to use in revising for Week 5. For some students, that comes as a real surprise; it is often the case that they have never, literally never, revised a piece of writing for a class since Freshman Comp. Week 5. Revise and Publish Introduction. This is a really exciting week because the Storybook websites really start to take shape, having both a coverpage and a separate page for the Introduction. Weeks 6-8-10-12. New Story. After the Introduction is published (and students get comments back from me on the revised version in order to do more revision if needed), it's time for the first story in Week 6, with new stories in alternating weeks: write-revise-write-revise, etc. If a student stays on the regular schedule, they turn in new stories during Weeks 6, 8, 10, and 12. Weeks 7-9-11-13. Revisions. 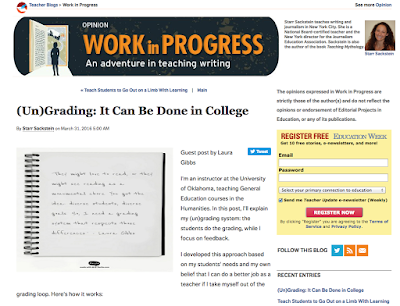 I've written another post about the revising process and the importance of feedback and revision in the overall flow of the class: Writing - Feedback - Revision. The feedback and revision process is an essential part of the Storybook projects, and the same weekly cycle is also how the Portfolio project works, too: write-revise-(revise)-write-revise-(revise)-and so on. 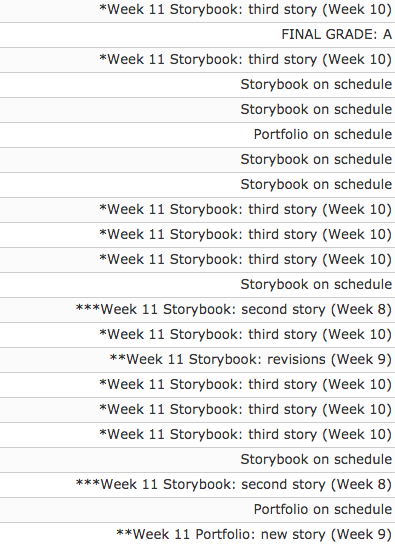 As you can see, the Storybook project is over in Week 13, two weeks before the end of the semester: students on the regular schedule add their last story in Week 12 and revise it in Week 13. There are no Storybook assignments for Weeks 14 and 15, and that's where the flexible schedule and the free passes come in! Free Passes and Alternate Schedules. For students who complete the Storybook on schedule, there is no Storybook work in Week 14 or Week 15. I call those "free passes" because they get credit for a Storybook assignment in those weeks, although there is nothing they need to turn in. Those two weeks off are compensation for the fact that the Storybook is extra work compared to the Portfolio since the Portfolio contains stories that come from the weekly storytelling blog posts, while the Storybook stories are written in addition to the weekly blog post assignments. Instead of staying on track and taking Weeks 14-15 off, though, most students end up going on an alternate schedule, missing a week or two (or more) earlier in the semester. The first two times that they miss turning in a Storybook assignment, the free pass covers the gap in points, and the schedule just moves up to adapt. That sounds kind of confusing, but in practice it's very simple. If a student doesn't get their Introduction turned in during Week 4, they turn it in during Week 5 and remain on the "one-week-off" schedule. Similarly, if a student stays on schedule up until Week 10 when the third story is due, but they don't get the third story turned in that week, they turn it in during Week 11 and remain on the "one-week-off" schedule. If you look at that schedule - One-Week-Off Schedule - you will see that there is no free pass anymore in Week 14, because the student has used those points to cover an earlier missing week. If they are on the Two-Week-Off Schedule, that means they have used both free passes, and they have Storybook assignments still due in Week 14 and in Week 15. As you can see, most students actually end up on an alternate schedule (one or two or more weeks off the regular schedule) by the time the semester reaches the end. And that's great: the whole idea of the flexible schedule is that it is something students really need to accommodate their complicated lives! The Portfolio also has a flexible schedule, but it does not have the free passes. Instead, students can use extra credit to make up for any missing Portfolio assignments. HISTORY. The flexible Storybook schedule is something I have had in place since the first year or so that I started teaching online. I noticed that sometimes students got confused about just what they had due, so starting in about 2010 or so, I began using the text field in the D2L Gradebook to give students a reminder about what schedule they are on. The free passes are something new for Fall 2014, which is also the first semester that there was a Portfolio option; the free passes are my way of compensating students for the extra work involved in the Storybook compared to the Portfolio. I always had what were essentially "freebie" Storybook assignments in Weeks 14 and 15, just revising the Introduction and then doing a final revision check. Now, though, it is so much more useful to really acknowledge them as freebies and let students take advantage of that when they really need them, rather than just getting a break at the end of the semester. So, I've folded those final revisions into the process of adding the last story, and now the students have the free passes for whenever they need them during the semester. GOALS. My overarching goal is for the students who choose the Storybook option to end up with a project that they are proud of. The flexible schedule is designed to keep the students always moving forward so that in any given week they can make progress on their project without worrying about a lack of progress in the previous week(s). Overall, I am extremely happy with how the Storybooks are working. Adding in the Portfolio option was clearly a good choice, both for students who are looking for a semester project that requires less time than a Storybook project and also for those students who, for whatever reasons, are not ready to commit to a Storybook project topic by the time Week 4 of the semester rolls around. Because of the success of the Portfolios this semester, I am hoping that more students will choose the Portfolio option in the future. Exactly because it is different from the Storybook project, it offers the students some really good opportunities. Even with the Portfolio option in place, I am seeing some students this semester whose Storybooks have gotten stalled out. It's not a widespread problem, but I think those few students might have been happier with the Portfolio option and would have ended up with something more satisfying than what they have with the stalled Storybook. One student switched over to the Portfolio even after she already had her Storybook up with one story in it (an excellent story... but her topic was indeed a lot of work! ), and she ended up with a wonderful Portfolio. So, that was something I did not anticipate but was really glad to see, and I would like to promote that option in the future, especially for students who feel stuck with their Storybooks. So, one thing I am thinking about doing next semester is to build in the Portfolio option as a choice right from the very start, so that students who want to commit to the Portfolio already in Week 3 or 4 can do so. If they do not find a Storybook topic that really interests them, the Portfolio should be an option they can choose already in Week 3. Another thing I need to do is improve my communication with people who are falling behind on their Storybooks. In the past, when the Storybook was the only option, it made sense to let people fall behind provided that they ended up with at least two stories in their project by the end of the semester. I did not really have an alternative to offer, after all! Now, though, the students who get four or five weeks behind on their Storybooks are not doing themselves a favor. They probably should switch over to the Portfolio so that they can still come up with a good writing project for the class, as opposed to the real risk of not ending up with even two stories in their Storybook. So, I am going to focus on the two free passes next time, and when people fall more than two weeks behind on the Storybook (the two weeks covered by the free passes), I will urge them to consider the Portfolio. I won't require the switch... but I'm guessing it would help the students to see the Portfolio as an option if they are feeling stuck with their Storybook. 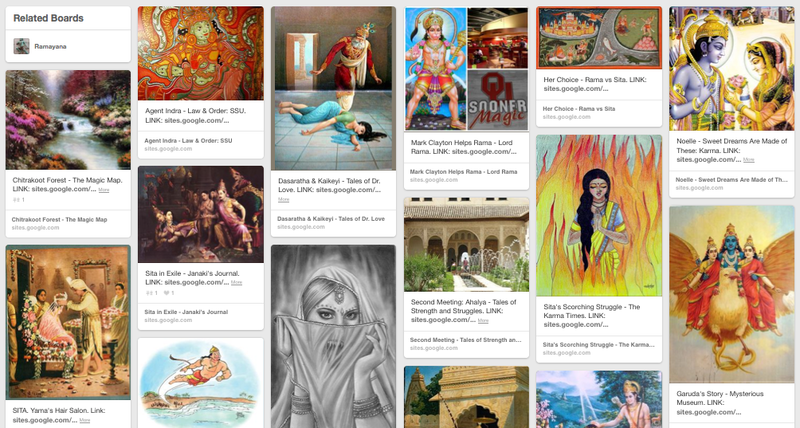 One fun thing from this semester has been pinning new stories from the Storybooks to a special Pinterest Board for each class: Indian Epics and Myth-Folklore, so here is a screenshot of the current Indian Epics Board below. I like being able to keep track of the individual stories by pinning them this way, in addition to the class Storybook lists.